Our Phuket Rafting Tour will bring you to Phang Nga provice north of Phuket. Enjoy an unforgettable day in the jungle of Phang Nga with plenty of rafting fun suitable for all ages. 5 km White Water Rafting ! Visit to Suwan Kuha Temple! During 1 Mar – 30 Apr 2019 below packages are only available on request and subject to surcharges. Please contact us for more details. Phuket hotel transfers for hotels in the main tourist areas**. Visit at Suwan Kuha Temple. White Water Rafting, Helmets & life jackets. Upgrade to 9 km rafting available on request. Adults only! Phuket hotel transfers for hotels in the main tourist areas. Rafting, Helmets & life jackets. More images about our Phuket Rafting Tour from Phuket to Phang Nga on Flickr or on our blog. Timing for Pick up and drop off is the same for all Phuket Rafting Tour packages. depending on the package you booked below itinerary will change. 07.15 – Pick up from your hotel in Phuket Island. 09.00 – Visit at Suwan Kuha Temple (also known as the Monkey Cave) in Phang Nga Provice. 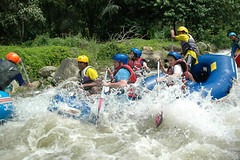 10.00 – White water rafting training with experienced rafting instructors. 10.30 – 5km action loaded white water rafting fun. 12.00 – Thai buffet Lunch at rafting camp. 13.00 – Guided jungle walk to Tone Pariwat waterfall. 14.30 – Enjoy a Thai Herbal Sauna or simply relax at the rafting camp. 16.00 – Transfer back to Phuket Island. 17.30 – Drop off at your hotel. Note: The Phuket rafting tour program may change due to the weather conditions. Get in touch now with our Easy Day Thailand team for your Rafting adventure. If you have any questions please do ask. Our Team is always happy to answer.